Kidd's Restoration responds to water damage 24/7 and 365 days a year. Call us today for immediate service for your home or business. Fire damage restoration requires expertise and experience in order to properly protect and restore your home and/or business. If you have black mold in your home you can call Kidds Restoration for a free in-home inspection and evaluation. Storm, wind and natural disasters can be catastrophic for any homeowner striking at any moment causing major damage to your home. Kidds Restoration can respond day or night to help you. Kidd’s Restoration is your local family owned insurance restoration services specialist. Kidd’s Restoration is a full-service restoration company and general contractor who will manage your restoration project from start to finish with our award-winning craftsmanship. Our on-call technicians are available 24 hours and use the latest state-of-the-art technology for a quick, thorough, and guaranteed drying process. 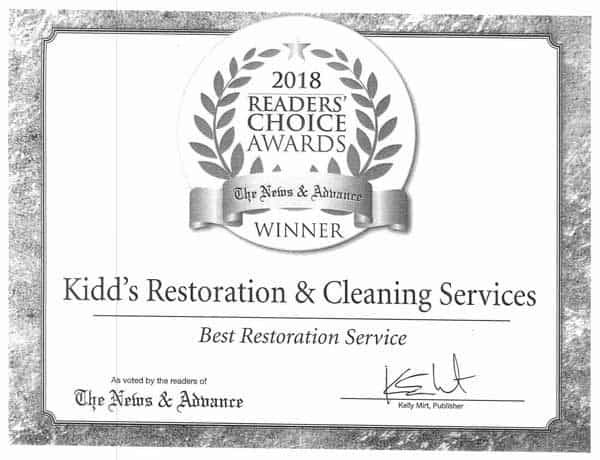 Whether you need water damage restoration, fire damage restoration, smoke removal or other restoration services Kidd’ss Restoration is your go-to company. Kidd’s Restoration services the entire surrounding areas of Lynchburg VA and Roanoke VA. Disaster strikes suddenly… water damage, fire damage, high winds associated with hurricanes and tornados, flooding, or vandalism. Any of these can be a traumatic experience. Kidd’s Restoration is available whenever an emergency happens. A single phone call can bring our prompt, professional assistance to help reduce the loss resulting from these disasters. Our experienced specialists are trained in every aspect of the latest techniques and equipment. Over 25 years in business, we have handled thousands of jobs that have involved water damage, fire damage, smoke or soot, or vandalism. If the damage is managed properly from the initial call, the entire restoration project will be finished sooner. Managed improperly, further damage and loss can occur. Structural repair, reconstruction and remodel. As a licensed Class A Contractor (VA License #2701037459A) and Asbestos Contractor ( VA License #3306001231), we are able to complete the most difficult reconstruction jobs, going far beyond the capabilities of simple cleaning services. We can also repair your property from the ground up in the event you incur a total loss to your property. We can bill your insurance company directly and can prepare a professional estimate for approval by your insurance adjuster. We can also line up financing with a third party vendor to help you financially. We accept most credit cards for the purposes of meeting deductibles. Our CAT team is well versed in full-scale disaster recovery procedures. They travel the east coast with a large variety of drying equipment, including 3 trailer mounted desiccant units. The team specializes in schools and large commercial buildings, helping to minimize your downtime. Our teams of professional cleaners are well versed and prepared to handle any situation, ranging from daily needs such as carpet, rug, and janitorial cleaning, to the wide range of disaster-related situations which require specialized services. Our goal in any of these scenarios is to exceed your expectations. We have certified technicians on staff who have the experience of on-site work and the technical knowledge certified by the IICRC. Kidd’s Restoration Services is a licensed general contractor in Virginia (license #2701037459), Asbestos Contractor (license #3306001231) and can handle your reconstruction project of any size. After you have water damage or fire damage there are a lot of instances where you as a homeowner are going to need repairs for your home. We can do the put back after water damage, help you with a remodel and everything involved in a complete gut and reconstruction project after a fire to your home. 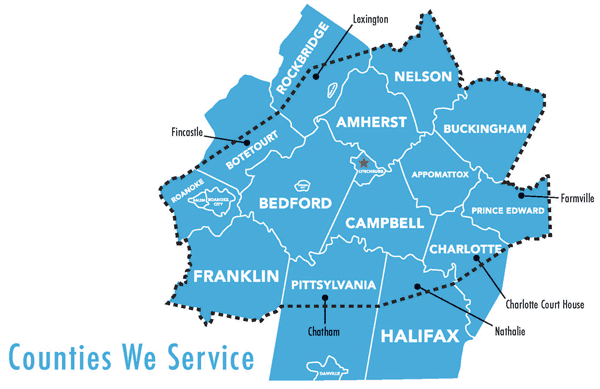 If you need an estimate and consultation, call us today for a free quote in the Lynchburg, Roanoke and central Virginia area. If you’re looking for a local restoration company that provides full-service restoration services, look no further. Kidd’s Restoration Services has licensed water and fire damaged certified technicians on staff ready to respond 24/7. Had a devastating home fire and Kidd's Restoration responded fast to secure my home and get it boarded up. Afterwards they worked with my insurance adjuster to make sure everything was going to be done correctly and they cam to an agreed upon price with the insurance. The process, considering a major home fire, could not of been easier! First time using Kidds Restoration and Cleaning and I would use them again if I had to, let's hope I don't, lol. We had water damage in our closet, not a huge area but they still took care of us like we were their only customer. Definitely recommend you go no where else and hire Kidds Restoration for you water damage cleanup. Kidd’s Restoration Services is a restoration company that provides emergency restoration services to all of central Virginia. DKI Services is the largest disaster restoration contracting organization in North America. Providing quality restoration services to insurance, commercial, and residential clients, including emergency response, water damage restoration, fire damage and contents cleaning, mold remediation, complete reconstruction and much more.